Leaving only Kitty and her friends to stand against him – even if she has damaged her own credibility by trying to rally people against Roman’s plotting. She doesn’t know where he is or how to stop Roman’s immense magic – nor even how to avoid the vast power of his influence, but the world hangs in the balance. So in this book I expected those friends to gather. I expected Kitty to lead them, to gather her coalition, to take advantage of the group she’s put together. And she doesn’t. Oh, those friends appear – Grant, Rick, Tina, Sun and a few others. But they appear because “fate” or because “magic” or some other mystical force guided them. Fate is such a very lazy way of writing because it can justify just about any kind of coincidence. There’s very little emphasis on these people, what they bring to the party or much of their history and involvement with Kitty or why they matter now. And, again, most of her contacts are just irrelevant here (and even most who turn up basically fight a battle where we and Kitty are not). Ok, the point can be made that the reason fate is directing all of these people towards Kitty and I can concede that. But it still rather robs Kitty of leading this book which is another main problem I have with it. After an initial attempt at a trap in the opening scene (which Kitty fiercely opposes) the rest of the story is out of Kitty’s hands, she completely fails to direct the plot or even actively oppose Roman. Honestly, if Roman and his boss had just decided to skip Denver, Kitty wouldn’t have been involved in the plot at all. They didn’t need to try and bribe her, or conveniently capture her or hunt her – they could have just got on with their plot and Kitty wouldn’t have had a clue of how to stop him nor would he really have done much other than run around and be panicked and worried. Which brings me to the third element that didn’t enthral me in this book. The enemies. Firstly this whole volcano thing which has been rumbling around for some time now. Roman has a spell he is gathering that will cause a volcano to erupt. Which… ok…? I mean it’s powerful and scary but what are you actually going to do with that? It’s hardly going to give him command of the world or anything else, certainly not more so than all the people he’s rallied to support him. It isn’t necessary to bring down Kitty (in fact, tangential rant, why is Roman and boss bribing Kitty or messing with the odd vampire – why not just send 20-30 vampires to her back garden and tear her into teeny tiny pieces?) because you don’t need a volcano to kill one person. Even when we learn the true plot, I can’t see Roman or his boss particularly seeing any advantage to reducing the whole world to a wasteland…. Why do that? When they’re already gaining so much power and influence, why decide to reduce the world to a wasteland? What does this gain? I’m not saying it can’t be a motive, but this book didn’t really sell it or explain it to me. I also didn’t much like the whole origin story of vampires and werewolves. Yes it made a point that werewolves and vampires had a choice whether to be good or bad – and it was an awesome idea that Kitty was a big enemy simply because her radio station was passionately encouraging people to be more human which went against everything they stood for. But I don’t think it sat well with some of the previous books that kind of established werewolves (especially) as fairly wolf-like. 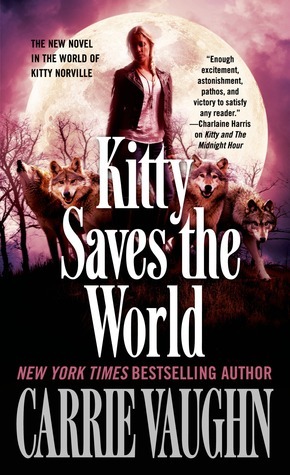 When Kitty is imprisoned in a cage as a wolf she doesn’t snarl and growl – she cowers and whimpers. That was one of the excellent points of this series – it made a point of making wolves, well, wolfish. It’s ironic that one of best series for making wolves so natural has such a demonic, supernatural origin for them. It’s not a terrible glaring thing and, yes, it does really work with Kitty’s radio show. Final disappointment – the plot. As I said before that Kitty doesn’t really drive the plot and the bad guys have to practically drag her into it. But when the final show down happens not only does she manage this because of the convenient appearance of various fated people but she only wins because of a random magical item that Cormack just stumbled upon. Which is my underlying annoyance – this plot is held together by convenient happenstance, which is basically something that can only help by writing feat. Inclusionwise, Sun one of the main contacts in Kitty’s group and is Asian. A few more of Kitty’s people are Latino. It’s not a huge level of inclusion that largely rests on previous books for development. There are no LGBT characters. Kitty does shine through this book despite what I’ve said and I do like that the emphasis on her character as building a coalition and being such a force for improving and inspiring people. I also really like her relationship with Harden which has been a long, background arc, which have really developed over the series. They have been antagonistic, Kitty has kept many secrets and finally we’ve reached this part of mutual trust, aim and co-operation. I like that a lot. In the end, it’s not a bad book, not at all. It has a decent (if shaky) story and does bring things to a clear close. I just feel that it’s not a great ending to this series, it doesn’t live up to its potential, fails to develop several elements and, I feel, was a little forced and pushed at times.